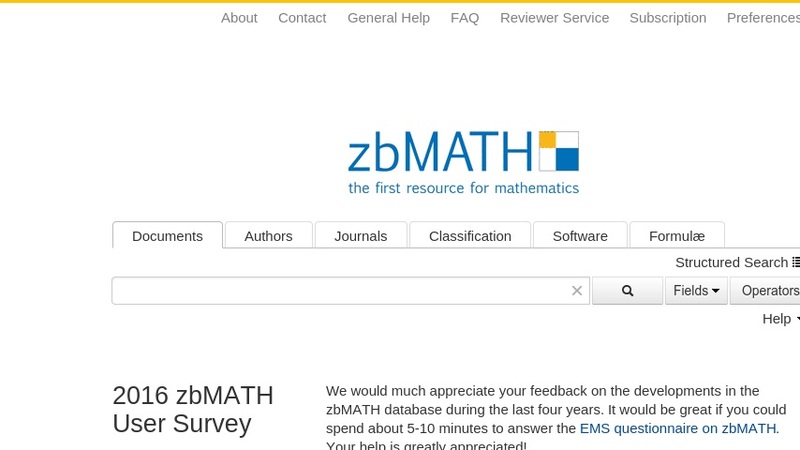 Zentralblatt MATH is an extensive database containing abstracts of reviewed articles in pure and applied mathematics. The database contains over two million entries drawn from more than 2,300 serials and journals. The publication dates for the articles begin in 1868 and continue into the present. The search function is flexible, allowing visitors to search the database by numerous criteria such as author, title, keyword, source, or classification code. The abstract entry includes links to abstracts of articles on related topics. Only abstracts and issue table of contents are available free of charge, and access to the full articles is only available by paid subscription.